ITEM NUMBER VM0304219 VAUXHALL ASTRA ACTIVE 2004 CAR BROCHURE. 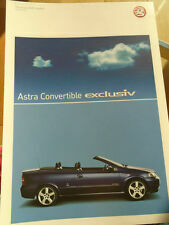 Here we have a official 4 page brochure for the Vauxhall Astra Convertible EXCLUSIVE. Specifications, options, colour and trim options are included. The brochure is in mint condition. Vauxhall Ref. 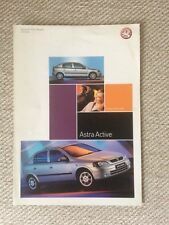 2004 Vauxhall Astra sales brochure, UK market. Printed 04/04, 47 pages. ITEM NUMBER VM0404983. 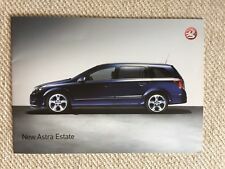 JULY 2004 VAUXHALL ASTRA ESTATE RANGE BROCHURE. Item format : Stapled brochure. Brochure size (closed) : A4. No credit / debit cards. Year : 2004. Factory Reference :VM0304221 - September 2003. 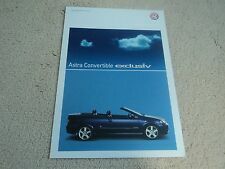 A rare original Vauxhall Astra Convertible Exclusiv brochure dated Dec 2004. Brochure is 4pp illus in colour and is in very good condition. ITEM NUMBER VM0404718 PUBLISHED APRIL 2004 VAUXHALL 2004 ASTRA MODELS CAR BROCHURE 47 PAGES. Undated but c 2004, captioned below. Publication number 04170. Dated Spring 2004 and covers 2004 models. 52 page booklet, well illustrated, English text. Dated February 2004 and covers 2004 models. 6 page folder, well illustrated, English text. 4 page folder, well illustrated, English text. Dated August 2003 and covers 2003-2004 models. 12 page booklet, well illustrated, English text. Dated January 2004 and covers 2004 models. 48 page booklet, well illustrated, English text. Dated April 2004 and covers 2004 models. 44 page booklet, well illustrated, English text. Dated April-July 2004 and covers mid 2004 models. Astra Sport Hatch petrol & diesels. Dated April 2005. I HAVE A HUGE COLLECTION OF ALMOST 5000 AUTOSPORT MAGAZINES RANGING FROM 1950s TO 2007. Publication No - none. A4 & 48 high sheen sides! 40 page booklet, well illustrated, English text. Dated February 2004 and covers Spring 2004 models. Undated but c early 2004 and covers 2004 models. This comes in a good used condition from a smoke and pet free home.Thanks for looking and please look at my other items for sale. 40 page booklet, well illustrated, English text. DatedOctober-December 2004 and covers late 2004 models. 40 page booklet, well illustrated, English text. DatedDecember 2004-March 2005 and covers late 2004-early 2005 models. 44 page booklet, well illustrated, English text. Dated July-September 2004 and covers mid 2004 models. 16 page booklet plus 8 page specification insert, well illustrated, English text. 21x30cm approx. Dated May 2004 and covers 2004 models. 6 page folder, well illustrated, English text. It is in the described condition. All variations of the Astra H at launch. Portrait - Very Large - 33cm x 29cm x 6cm. MODELS COVERED. 4 page folder, well illustrated, English text. Dated December 2004 and covers 2004-2005 models. Profile of artist, Lucia Helenka. Drive of the 120bhp Astra 1.9 CDTi. Profile of Ryan Lee and Lewis Peart (children starring in a series of Vauxhall 'Little Dads' TV adverts). A look at the VX Racing BTCC team. MAKE: VAUXHALL. MODEL: ASTRA ENJOY & SPORT. YEAR: 2004. PUBLICATION NUMBER: VM0404724. 10 page booklet, well illustrated, English text. Undated but c late 2003 and covers 2004 models. Monaro VXR. Zafira VXR. VAUXHALL VXR Sales Brochure. 2005 Models Edition Number 3. Dated July 2005. I HAVE A HUGE COLLECTION OF ALMOST 5000 AUTOSPORT MAGAZINES RANGING FROM 1950s TO 2007. 44 page booklet, well illustrated, English text. Dated January-March 2004 and covers early 2004 models. 48 page booklet plus 20 page specification insert, well illustrated, English text. 2004 models edition 1, dated August 2003 and covers 2003-2004 models. Irmscher Styling. 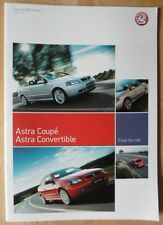 VAUXHALL ASTRA COUPE & CONVERTIBLE Sales Brochure. Astra Coupe - 1.6i 16v, 1.8i 16v, 2.2i 16v, Turbo. Astra Convertible -1.6i 16v, 1.8i 16v, 2.2i 16v, Turbo. Dated September 2003. I HAVE A HUGE COLLECTION OF ALMOST 5000 AUTOSPORT MAGAZINES RANGING FROM 1950s TO 2007. Vauxhall Car Range 1998 Models Number 2. A stylish brochure, nice spread per vehicle, photos one side blurb t'other. Date: 1998. 4 Page colour brochure. In very good used condition. Vauxhall Astra Range. Factory Brochure 2004. Factory code: VM0404718.